What’s the deal with encrypted backup drives? You are here: Home / Network and Application Security / What’s the deal with encrypted backup drives? In an age littered with cyberattacks being launched from behind screens halfway around the globe, it’s hard to imagine the idea of someone willing to entertain the risk of physically stealing a corporate backup appliance from a secure data center. Obviously this scenario isn’t as common as the data breaches that continue to make headlines; however, certain industries require data to be encrypted at rest for compliance purposes — ensuring that any lost or stolen data can’t be viewed by anyone other than its owner. Physical security threats are still an important part of a proper data protection solution. Lost or stolen disk drives or appliances cause immense headaches and legal exposure for organizations with critical and/or sensitive data. Barracuda Encrypted Backup appliances help protect the privacy of data if disk drives or appliances are lost or stolen. The encrypted data on the disk drive is inaccessible when separated from the backup appliance – making sure it can’t be used maliciously when in the wrong hands. Software-based encryption solutions suffer significant performance and efficiency degradation while complicating the deployment process with extra configuration steps. 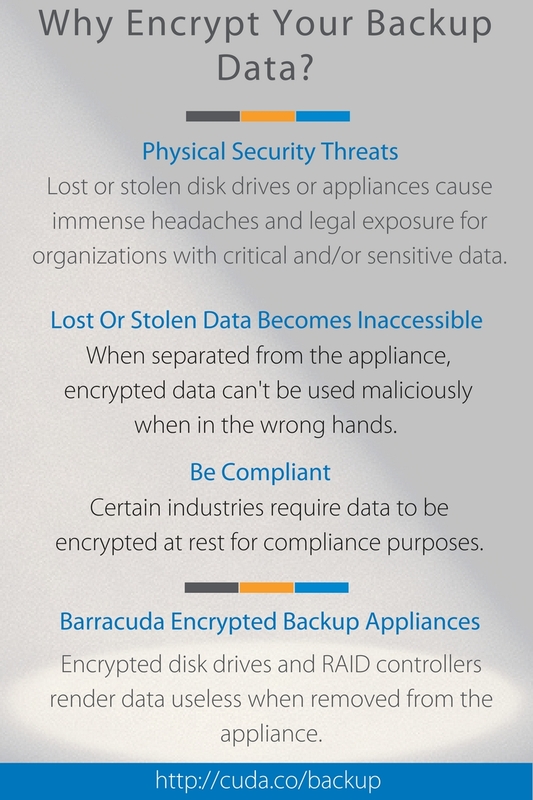 Barracuda Encrypted Backup appliances use disk drives with native encryption, avoiding all of these problems. Minimal configuration necessary – minimal user configuration is necessary to enable encryption on the protected devices. Minimal performance degradation – unlike software-based solutions, users will not experience meaningful performance degradation when using native disk encryption. Storage efficiency – software-based encryption typically degrades deduplication performance. Because Barracuda Backup uses native drive encryption, we are able to fully leverage deduplication for maximum storage efficiency. Protection against vulnerabilities of software-based encryption such as brute force attacks – encryption and decryption is performed by the disk’s self-contained onboard hardware, so the risks of contamination, malicious code infection, and other vulnerabilities are significantly reduced. While these use case may be specific to certain verticals, there are plenty of reasons to learn about encryption. If you have any questions, please visit the Barracuda Backup page or contact us.